Animator vs. Animation IV - animated short film! The viral video from 2006 has come pretty far. Thanks to you, it's still going strong. 446 backers pledged $11,280 to help bring this project to life. We're funded!!! Now the next stretch goal to reach is $13,000, to offset the Kickstarter/Amazon fees as well as the rewards/shipping fees. This way I'll ACTUALLY have $10,000 when all is said and done, instead of $7,700. The further stretch goal of $20,000 still stands, if I reach that I promise to get Animator vs. Animation done in 9 months (as opposed to a year)!! We could also subdivide it and say $16k = 10 months, $13k = 11 months. Here's your chance to give me ideas for the next animation! Thanks again for sharing with your friends. My name is Alan Becker. When I was 17, I made a short animation on my laptop and put it on the internet. Now, including its sequels, it has 218 million views. It's called Animator vs. Animation. It has been featured on CNN, G4 - Attack of the Show, the Wall Street Journal, 10 international film festivals, and has been included in a few published art commentary books. Because of this one animation, clients came to me with animation requests and I became a self sufficient freelance animator right out of high school. Here's my website. Animator vs. Animation plays with the idea that the little stick figures that you animate can fight back and do damage to your computer. Since the world of computers is so vast, the possibility for gags is endless. I've had the stick figure engage in matrix style fighting with all the icons on the desktop, a one-on-one duel with Clippy (the old Microsoft Word Assistant), a solitaire fight with another stick figure using cards, the list goes on. Now we're entering the age of tablets and iPhones, so the spectrum of possibilities is even wider now. I told everyone I was done after number three. It's such a conclusive ending, so hard to top, plus, film history shows us that any series that goes past three starts to go downhill at four. But people were so upset that I was ending the series because they found it so entertaining. Requests for number four came at me from every angle. So I'm deciding to do it. It'll be fun. In the past, animating was easy because I was just a high school kid dependent on my parents. Now I have rent, car payments, and bills. I recently graduated from Columbus College of Art and Design, which is not cheap, so I also have loan payments. I want to make Animator vs. Animation IV because it would make SO many people happy, but now that I'm grown up, time is literally money. I'm predicting that this film will take 300-400 work hours, since the third one took 325 hours. Since the fan base is so big, I decided to let those who want number four help make it happen. WHAT AM I GIVING YOU? I want to make it clear that this Animator vs. Animation IV project is a give and take relationship. Yes, you are helping and supporting me by donating to this project. But I am also giving you something that will be very hard to find anywhere else. One of the rewards is access to behind the scenes tutorials. I will take you step by step through the entire process. I start by announcing the problem I have to solve, for example, "Okay! I have to make it look like the stick figure is reacting to my finger swiping the iPhone screen left and right!" then I show you how I solve that problem. Now you have a better idea of how to solve problems! This is in essence giving you access to the knowledge that took me 7 years to build up, including 4 years of college, worth around $100,000 of tuition dollars. The reward costs $10. Another reward that you WON'T find anywhere else, is access to the original source files of Animator vs. Animation 1, 2, and 3. Until now I've made it my policy to not share the files, for fear that someone will take them, slightly alter them, and share the video as their own work. That's still not cool, but now you can see peel back the animation layer by layer. They say a magician never reveals his secrets, well, I guess I'm not a magician. I promise that all of your donations will go into the production of this film. And I assure you I am qualified to be asking this much. This is not your ordinary stick figure animation that teenagers will make over the summer for fun. This is professional level motion graphics, animation and live action compositing, with the inclusion of stick figures as a means to mimic the spirit of the teenaged animator. Once the project is funded, I will set the funds in a separate account and only pay myself as I work, by the hour. Any extra funds will go into post production, including film festival fees, etc. Here are some incentives to back this project. Every reward includes the rewards above it. $10 - BEHIND THE SCENES ACCESS. I'll release a video every one or two weeks explaining my process and showing progress. This is education you can't get at school because a lot of techniques I came up with myself. PLUS EVERYTHING ABOVE! $15 - YOUR NAME IN THE CREDITS. PLUS EVERYTHING ABOVE! $20 - The original .FLA files of Animator vs. Animation 1, 2, and 3. If you have access to Adobe Flash, you can pick through the source files for your own reference. I've denied many requests for access to these files in the past, but now I'm opening it up. PLUS EVERYTHING ABOVE! $30 - A SIGNED POSTER designed by me. It's got a retro pixel art look to it. PLUS EVERYTHING ABOVE! $45 - AN OFFICIAL T-SHIRT designed by me. Also with the retro pixel art look. PLUS EVERYTHING ABOVE EXCEPT the POSTER. $75 - AN OFFICIAL T-SHIRT designed by me. Also with the retro pixel art look. PLUS EVERYTHING ABOVE! $100 - CAMEO APPEARANCE. Your name and/or photo will be somewhere in the animation. Maybe a photo in the Photos Folder or iPhoto, a profile picture in the animator's Facebook, or a contact photo. Definitely bragging rights. PLUS EVERYTHING ABOVE! $125 - ONLINE VIDEO CHAT. Using Skype, Google Hangout, or ooVoo, you can ask me about anything, show me any of your work, or just chat for as long as you want. I will make sure that it is worth your time. There is no time limit. In fact, we can continue conversation another day, and into the indefinite future. PLUS EVERYTHING ABOVE! $1,000 - SPECIAL THANKS. You'll get a special place in the credits as well as a "Special Thanks" credit on IMDb. PLUS EVERYTHING ABOVE! $5,000 - EXECUTIVE PRODUCER. You'll get an even more special place in the credits as well as your own credit on IMDb. I'll throw in a personal random gift sent to your door. PLUS EVERYTHING ABOVE $1,000! $10,000 - "PRODUCED BY" You are the person that singlehandedly funded my project. I am eternally grateful to you. It'll be like "animated by Alan Becker" - fade in, fade out - "produced by ______". You'll also get your own credit on IMDb. And I'll send a personal random gift to your doorstep. PLUS EVERYTHING ABOVE $1,000! Here's a link to my IMDb page so you know what I'm talking about. 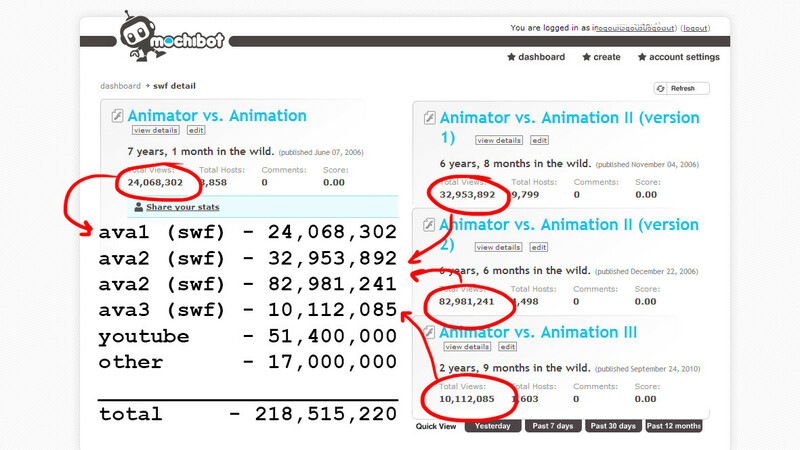 Apparently, someone with IMDb authority registered Animator vs. Animation as a short film and listed me as the author. I didn't know about this until a few months ago. A separate person registered Animator vs. Animation 2 and 3, and created a new Alan Becker. So I had to go through the complicated process of merging the two Alan Beckers. As soon as Animator vs. Animation IV gets approved by a film festival, it is eligible for inclusion on IMDb. I use mochibot to track the view counts of all my Flash animations. Adding up all the view counts in mochibot and youtube alone, I have 218 million views. Even though this animation series has received 218 million views, the amount of people I can actually reach out to with my current social network is much smaller. I have only 10,000 YouTube subscribers, 1,000 likes on Facebook, 300 Twitter followers. The challenge is being able to get the word out to all the people that have seen these animations and would like to help make the fourth one possible. an HD digital download of the completed animation, as well as HD versions of the first 3. It actually takes some editing to make them HD since the original size is only 500x450. EXCLUSIVE access to BEHIND THE SCENES CONTENT. I will release a password-protected video every one or two weeks explaining the process. Think of it as access to my 7 years of Flash experience, including 4 years of college education (100k value), for $10. Hehe. Plus digital downloads. YOUR NAME IN THE CREDITS. Your name will be part of the animation for all eternity. Plus all the above. THE ORIGINAL .FLA FILES for all you Flash animators out there. If you have Adobe Flash CS6 you can take apart my animations and learn from them! Plus all above rewards. a signed POSTER based on Animator vs. Animation. Hang it on your wall and show off that you were directly a part of this project. Plus all the above. T-SHIRT: an exclusive Animator vs. Animation IV T-shirt. no kidding. Does NOT include the signed print. Just the shirt. But it's a nice shirt. Does include everything else above. T-SHIRT: an exclusive Animator vs. Animation IV T-shirt. no kidding. plus all the above. ONLINE VIDEO CHAT. As long as you have internet and a webcam, we can have a face-to-face online chat about anything you want. I'll answer any of your questions. We can screen-share and you can show me your work, if you want. I will make sure that it is worth your time. There is no time limit. In fact, we can continue conversation another day, and into the indefinite future. SPECIAL THANKS CREDIT, you'll get a SOLID 3 seconds of screen time, in your own section in the credits. You'll also get a "Special Thanks" credit on IMDb. Plus all above rewards. EXECUTIVE PRODUCER CREDIT. You'll get a SOLID 3 seconds of screen time, along with anyone else who donates to this tier. You'll also get an "Executive Producer" credit on IMDb. I'll also send you a random gift in the mail. Plus all the $250 tier rewards. ". You'll also be listed with the executive producers. You'll also get a credit on IMDb. I'll also be eternally thankful to you. I'll send you something special in the mail. Plus all the $250 tier rewards.